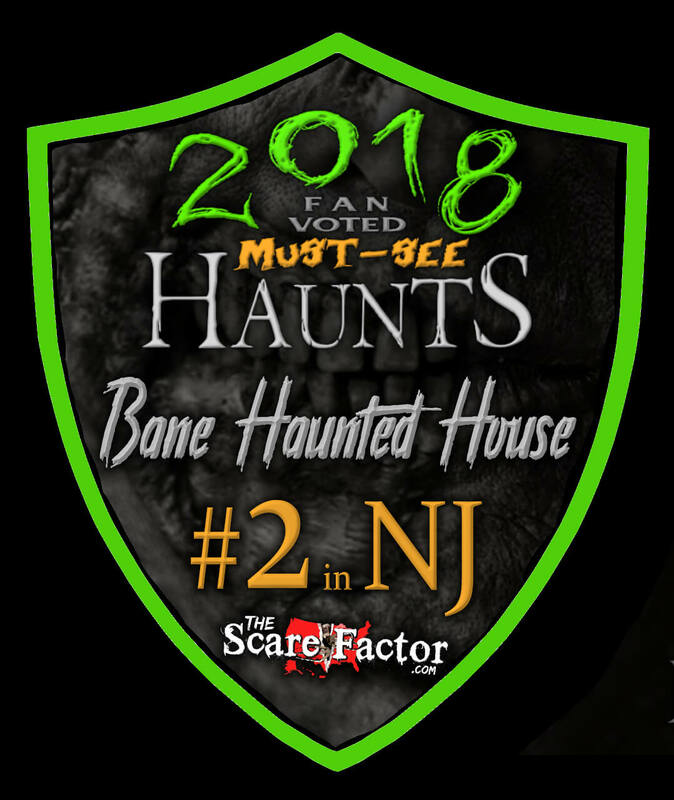 Bane Haunted House is a Haunted Attraction located in Livingston, NJ. 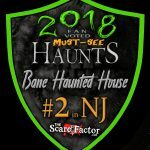 Team Old Crow Hollow reviewed this Haunted Attraction on October 5, 2018. Bane Haunted House is a 120% actor-powered haunt. It is a single-haunt walk-through attraction with escape rooms on-site as well, but the main attraction is all about putting you face-to-face with their demons. This is a full-contact haunt and, since the contact, intensity, and getting you out of your comfort zone is their bread and butter, their actors don’t just embrace those things, they savor them! Not only will you have to enter with only one other person, or possibly by yourself, they will have you climbing into, over and through places, as well as doing a lot of crawling on the floor – sometimes with humiliating consequences. It’s all about increasing your vulnerability and breaking any sense of safety or comfort that you may have. Right off the bat after getting our instructions and rules, including the line warning that we may be touched (which is a serious understatement), we were immediately separated and forced to crawl through tunnels. We were then put through a series of mazes and scenes where the actors popped out from all over the place. The finale of this attraction nearly made me tap out, but I found enough courage to keep my man card. It was also at this point when I remembered that, at anytime during the haunt, you can say “Mercy” and they will back off or let you out. We didn’t have to face the final humiliation upon exiting as we were literally the last group in the haunt for the night with a big thanks to the great staff there for getting us in at closing time! All in all, I embraced the physicality of Bane for what it was and the fact that it is what makes them different. Just be sure you’re ready to experience it! The cast here was fully committed to their tasks, but not so much their character roles; maybe half were playing a character and the others were there to just put you through whatever they had waiting at that spot. These are definitely not timid folks; you should know what you’re subjecting yourself to and then they give it to you. They are confidently forceful and you will do what they want you to do. It’s like the whole crew is on some aggression therapy session to work out their violent tendencies… on you! There are certainly enough actors as the maze is designed to allow them multiple points of getting to you. They are also convincing as most are not playing a fantasy-type of character; they are more like regular humans with murderous intent. They are very interactive and involved with you, especially since they are really running the whole game here. There’s not much in the way of special effects here and they utilize zero animatronics to my recollection. The cast make it all work and they do the heavy lifting by providing almost all of the scares themselves and by bringing the scenes to life by their presence alone. There’s not a lot of variety in characters or types of characters, but that’s also not the goal of Bane. It is a cohesive experience of people you don’t want to meet in a dark alley instead of a series of different genres of people. Had there been vampires or zombies here it would have felt weird and they would have taken away from the credibility and realism of the place. There were some standout scare actors in here. The most memorable was a mountain of a man, possibly the biggest I’ve ever encountered in a haunt, that emerged like a monster from a curtain. He put an arm on my teammate Rico and then swung me around by the hood of my hoodie! As I tried to move away, he directed me with, “You! Go there!” All of the actors were completely into it and gave us all of what they had. This haunt is not for those with physical issues, but during some of the crawling areas, our teammate was helped out along the way by the cast and they stayed in character while doing so. Costumes were fairly simple, especially since these are meant to be regular people who just want to murder or torture anyone that comes their way. Nothing really stood out to us and, even though they are meant to blend in and be realistic, they could take it up a notch with more detailed costumes and more differentiation between the characters to further expand the theme of the area or maze. Most were in makeup – nothing too detailed or stand-out, but it’s also hard to tell when you really don’t want to look anyone in the face, or when they don’t want you to. I don’t recall many masks, as having a lot of them would probably take away from the realism of the people. Of the few we did see, they appeared to be of a leather-type. Side note: I think a post-apocalyptic theme would easily allow for greater makeup and mask options. Imagine radiation victims with faces horribly damaged and scavenger-types with biohazard masks. It could still be a violent, physical world, and maybe even more so! It was very easy to find the warehouse location, as well as the entrance that was right off the spacious parking lot. Without a doubt, you will know when you’re there. I can’t say enough about the staff here. They were really gracious in getting us in at closing time and running a tight ship. They also have a really well-trained group of actors. That would seem to be a tough thing to keep a control on, but they have a good handle on it. Despite the physicality, the actors were actually very safe with us and, other than the crawling on the hard floors, we didn’t really notice any dangers here. Controlled and forceful aggression is hard to keep in check, but they did a great job of it. When it comes to being able to find their information before visiting, all of it was fairly easy to find on their website. Ticket information was a bit confusing. If you purchase timed ticketing, be sure to arrive 15 minutes prior to your scheduled time. When we arrived at Bane, it was obvious that we were at a haunt. The signage and activity going on helped in preparing us for what was to come. The location and feel inside is definitely “industrial,” giving off more of an “underground” type of vibe. Bane’s reputation preceded it, so we were prepared and mostly knew what to expect. I pity the folks who show up unaware of what’s about to happen and must be really thrown for a loop at what they face when they go through. It’s very hard to tell how intense this attraction can be before going in. Because Bane is so actor-centric, there are almost no special effects here. It’s basically a straightforward and simple back alley beat down. Little bits of special effects could really help to enhance the overall feel of the haunt, though, and create more of a story, add some wow factor, and break up the more intense or physical portions of the haunt, including more lights and sounds to expand on the overall experience without losing any of the gritty realism (in my opinion). We made our way through a series of mazes. Our favorite maze was one made from chain link fencing. It had cloth draped over some of the panels and it was extremely difficult to navigate, which became very disorienting in the dark. The scenes themselves are set up to be more interactive than “set” scenes; they are full of obstacles and things you must get through. Although the location feels industrial and gives off an underground-type of vibe, I didn’t feel as if there was an overall theme. There were some scenes that were within a house, some that were more factory-like, some that were created to feel as though they were outside, and a really cool church area at the finale, but nothing really cohesive unless it’s supposed to be a series of random nightmare sequences… but I didn’t get that either. A theme introduction or dystopian future, post-apocalyptic theming would help tie it all together. There is a story on their Facebook page, but it wasn’t clear if they were trying to follow that. This attraction is definitely scary as you never know what they are going to do to you or make you go through. There is a lot of anxiety caused by that uncertainty and unpredictability, and the rooms themselves don’t help by giving a clue to what’s going to happen in there. 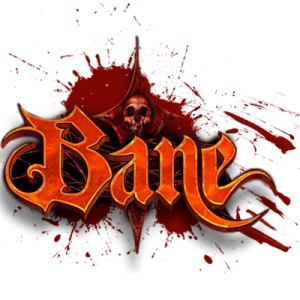 There is not much of a variety of scares here, mostly differing types of challenges and obstacles, but they certainly provide scares to every single person that enters Bane because… YOU are the group most of the time; it is all just you and your lonesome facing the evil here. There’s no place to hide or sneak through. I did feel that some stealth and subtlety would have actually increased the fear level instead of always being 100% full force and straight at you, especially when using a secret panel to jump charging at the guests. Sneak in, creep up behind when the guest is not looking and suddenly being behind them (at least sometimes) would probably make folks jump out of their shoes, especially considering the high anxiety levels that are already in place. The ending, which consists of some claustrophobic things, almost made me tap out. Fortunately, I was able to think it through to keep my man card. Just beware if you don’t like small spaces and spinning. Well, you certainly get a full night’s worth of entertainment in the time you are in there because you are so aware of everything going on and on edge the whole time. It is just the one haunt and there are escape rooms here for an extra charge. The only other outside entertainment we noticed was watching the guests before you as they are forced to exit the attraction, which is probably pretty entertaining until it’s your turn. The general admission price of $28.00 definitely seems appropriate for the half hour experience as you will feel every minute of it! VIP tickets are $48.00 for those extremely busy nights. I wasn’t scared until I had to go up a flight stairs and in the dark this guy with glowing eyes …show more scared to piss out of me. Then I was falling…OUTSTANDING actor.. will go back again with a few friends. An awesome experience!! I’ve never been to a haunt this intense!! Can’t wait to go back next year!! WOW, we heard it was fun and scary but we had no idea how crazy it really was. The crowd is awesome …show more while waiting online screaming and chanting! The actually ha it’s maze is like your in a movie. My entire office is going this year, we can’t wait ! !